Here’s Chris Jones’ obituary from the Chicago Tribune. This entry was posted in Celebrities, In memoriam, Playwrights, Regional theater and tagged Lanford Wilson, Purple Rose Theatre Company, Redwood Curtain, Talley's Folly, Theatre. Bookmark the permalink. How lucky for you that you had that opportunity and what a great memory! Seminole State College is presenting his play, THE RIMERS OF ELDRITCH. It will open April 8th at 7:30 p.m. and directed by John DiDonna. BOOK OF DAYS is on my wish list of plays to direct. 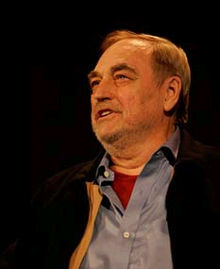 Lanford Wilson was one of the most gifted and humane playwrights working in my lifetime. Two of my earliest roles were as the Judge and the Preacher in Wilson’s “The Rimers of Eldritch.” What a wonderful challenge for a young actor, especially since we performed in a natural little amphitheater next to a pond. At the sound of my voice, the pond’s frogs would start chirping. We had to round them up and move them to a nearby lake. I look forward to seeing the upcoming production.